The aviation world is a pretty big place. Sometimes locating the aircraft part you need is like trying to find the proverbial needle in the haystack, especially if it’s from a World War II fighter jet. But the fact is, more often than not, Duncan Aviation’s massive inventory of parts, rotables, and exchanges for aircraft has exactly what you are looking for. Darrold Comber suspected his search would not be an easy one. His needle? A joystick from a Grumman F6F Hellcat Fighter with working buttons. After an online search showed Duncan Aviation listing the part in stock, he picked up the phone and called Lance Tophoj, Duncan Aviation Parts & Rotables Sales Rep.
With several joysticks available, Darrold asked Lance if he would personally pick out the nicest one with working buttons, because he had something special in mind for his father-in-law’s 90th birthday. 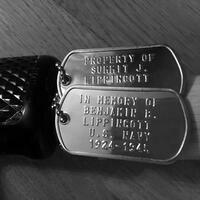 Summit Lippincott, Darrold’s father-in-law, has been an aviation enthusiast for most of his life. To him the Hellcat joystick holds significant meaning because his older brother, Benjamin, a World War II Navy Grumman F6F Hellcat fighter pilot, tragically died during a training exercise in 1945 while assigned to the Naval Air Station at Boca Chica, Florida. Because of his profound respect and admiration for his older brother’s courage and service to the United States, his children, grandchildren, and great grandchildren have consistently heard his memories and stories about growing up with his brother. 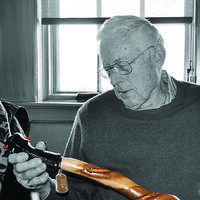 In honor of Summit’s milestone birthday and in memory of Benjamin, Darrold, created a one-of-a-kind handmade cane that featured a Grumman F6F Hellcat joystick as its handle. Two custom-stamped dog tags were added as the finishing touch. The reason we are able to offer this level of service is because of the extensive network of aviation industry contacts we’ve built through the years and the fact that we are available on our customers’ schedules, 24/7/365. Our inventory is competitively priced and checked against the industry marketplace regularly. All this, on top of our multiple OEM relationships and multitude of service agreements, is how our wide base of capabilities keeps customers flying. Our large and constantly growing rotable and exchange pool is never further than your telephone. And with a primary inventory of more than 485,000 line items, we’ll usually be able to handle your parts needs from stock. We like to say, we specialize in needles.